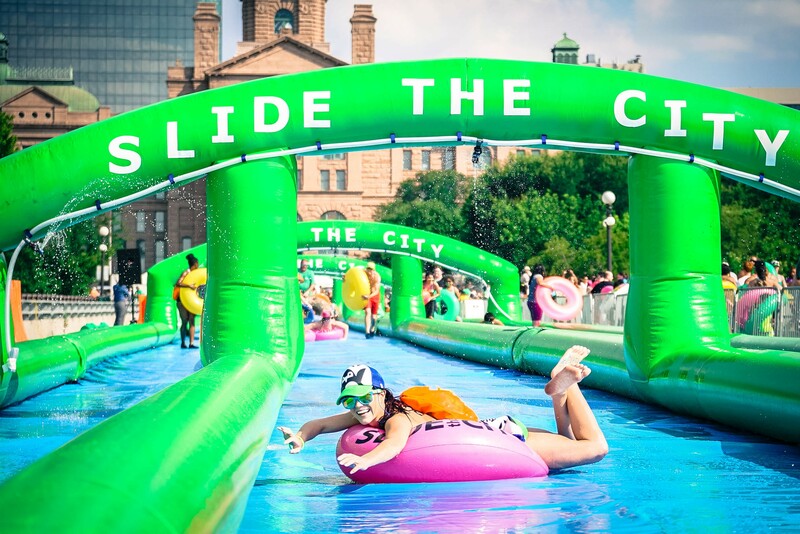 As wildfires continue to burn, and more of the state officially enters a state of drought, Bendites are preparing for the arrival of Slide the City, a giant water slide planned to stretch down College Way. If it seems odd that the City permitted a company to use Bend's water while the county is in a drought emergency, we'd have to agree. In its final Water Supply Outlook of the year, the National Resource Conservation Service notes that many Oregon monitoring sites set records for the lowest peak snowpack and earliest melt-out date since measurements began. And, from May to July 2015, Oregon saw the warmest average temperatures since 1895. Following Gov. Kate Brown's declaration for Deschutes County, the City of Bend issued a Stage 1 Water Curtailment, which asks residents to voluntarily reduce their water usage by 10 percent. When Slide the City initially applied, they were turned down. But the City gave them a pass in exchange for agreeing to recirculate and reuse water during the event. The approval also stipulated that if the City enters a Stage 2 Water Curtailment by September 5, when the slide is due to unfurl on Bend's west side, Slide the City would have to find an alternate water source. If Stage 3 were reached by that date, the event would be cancelled. But some of the conditions the City outlines for a Stage 2 curtailment have already come to pass, including "extended periods of above normal temperatures or below normal streamflows" and a drought declaration from the governor. Still, City Manager Eric King says that's designation is not likely to happen by September 5. "Our dual sources of supply are secure and we don't anticipate any mandatory cutbacks," he says. Despite this apparent confidence about Bend's water supply, the City is actively promoting water conservation, through its WaterWise program, sprinkler inspections program, a new utility rate structure, and more. "We're confident these efforts are helping to reduce water demands in the long term," King says. It's a confounding bit of mixed messaging. While we certainly can't fault Slide the City for looking to contract with willing municipalities, nor those Bendites who are eager to experience a massive temporary water slide, the fact that the City made concessions in order to permit the experience makes it difficult to take seriously its commitment to conservation. While Slide the City won't make or break the future of Bend's water supply, denying the event's application would have sent a strong and needed signal to local residents that it's time to reduce water usage, even if it cuts into our summertime fun.